With a centralized database that includes all connection and capacity information, you no longer need to run back and forth to the data center. Sunbird’s dcTrack DCIM Solution provides you with complete, accurate views of capacity, including physical space, power and network ports available in racks, plus the capacity of infrastructure devices like UPSs, CRACs, and circuit panels. Sunbird’s Capacity Management Solution provides you with complete, accurate views of capacity, including physical space, power and network ports available in racks, plus the capacity of infrastructure devices like UPSs, CRACs, and circuit panels. Our capacity management solution includes our dcTrack® DCIM software that displays your entire power and network chain with the click of a button. You no longer need to maintain files and files of Excel® and Visio®, nor make trip after trip to the data center. All the way up from the server to the power bank. 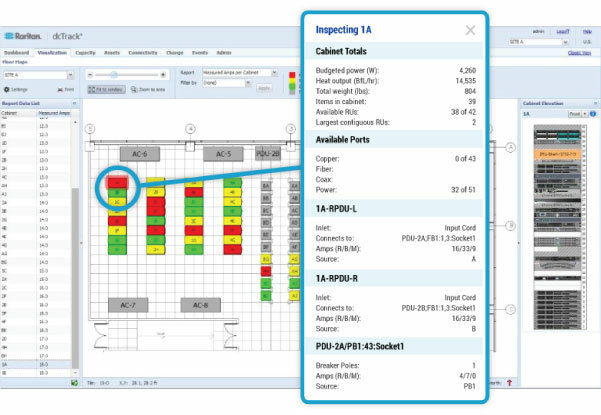 Know your capacity and simplify validation, troubleshooting, and maintenance. Automatically validate physical connections and media type & have a one-click access to any section of the data center.